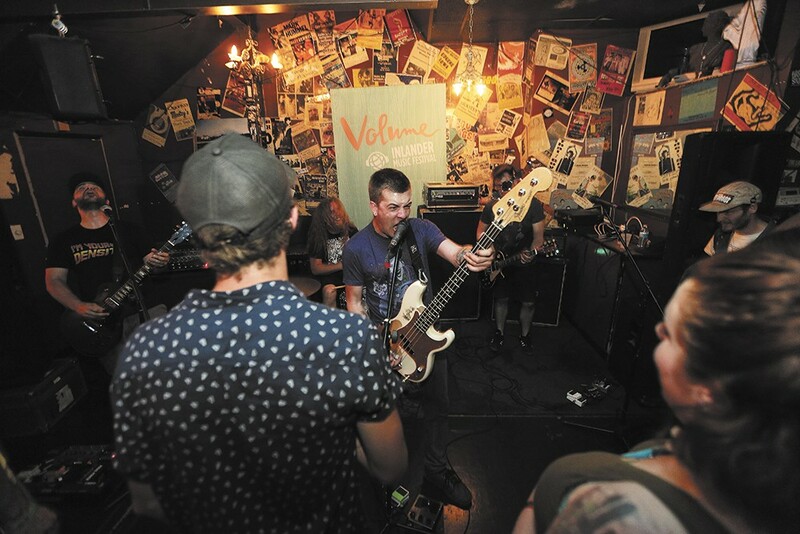 The Grenades perform at Mootsy’s (facing page) and Pérenne plays the Bartlett during Volume, the Inlander’s music festival. You may have forgotten what it's like to experience a truly excellent concert. Perhaps you remember the way your feet hurt from standing for hours, or how long you waited in the beer line, but a great performance can erase those inconveniences from the mind. As people dance or jump around you and sing along with the music, it's like nothing in the entire world matters. For those few hours, a band/artist can speak directly to your soul. Now, rest assured that live music is alive and well in this region. Just take a look at the annual music festivals like Volume, Elkfest, Bartfest, Perry Street Shakedown and the national talent coming to the INB Performing Arts Center, Spokane Arena and Knitting Factory. But there are other options, too. Below are some of the more intimate locations taking our local music scene to the next level. What you'll hear: Some of the top up-and-coming indie/rock/pop/electronic/folk talent in the world, as well as classic punk rockers. Open for more than two years, the sleek all-ages venue has managed to wrangle acts like Angel Olsen, Shovels & Rope, Mudhoney, Car Seat Headrest, the English Beat and many more. Acceptable attire: If you own any sort of fashion-forward hat, this is the place to wear it. Like every spot on this list, clothing here is casual and always depends on the type of music playing that night, but don't be surprised when most attendees show up in some sort of hipster uniform. Ticket price: Shows run anywhere from $5-$40. Even for local shows expect to pay some sort of cover charge; however, monthly open mic events are free. Cocktail experience: Adding liquor to its alcohol arsenal this year, the Bartlett now offers handcrafted beverages like Manhattans, gimlets and other old-man-sounding drinks. The bar is open Tuesday through Saturday, even when shows aren't running. Why you might like it: The vibe at Mootsy's can't be faked. People from all walks of life mingle at the 21-year-old venue, which, with the yellow door, looks every bit its age. It feels completely welcoming. Packed in for a sold-out show, this place gets hot and wild. The crowd mingles with the band, as the stage isn't raised. Here in these cramped quarters, serious punk shows are the best. When these bands play, it's as if there are no rules. What you'll drink here: Pabst Blue Ribbon in a tall can. On Fridays they're sold for a $1. It's the best way to fit in. How you may known it: The Pin! (known as Pinnacle Northwest when it opened in 2015) is Thomas "TC" Chavez's third music venture. Nearly a decade ago, he started the Cretin Hop on Howard Street, then moved to a new building on Monroe and renamed his club the Hop! After four years, Chavez started his new business downtown with the new moniker. An exclamation point? : Yes, really! Prior tenants: Most recently Club 412, the second-floor location has been the home of an array of clubs and live music venues, including A Club and even at one point, a ballet studio. Who comes here: The all-ages venue is more the type of place for heavy metal aficionados and underground hip-hop lovers. Expect a lot of black clothing here. But the 300-person-capacity space has more than enough room for all. Ticket price: $5-$20; many of the club nights are free. Acceptable attire: This is a 21-and-over country music place, so cowboy everything is to be expected. Rhinestones won't hurt either. Regular weekend: Currently, Luke Jaxon is the musician in residence, playing nearly every weekend there isn't a special event. Shows begin at 9 pm most nights, but show up at 7 for free dance lessons and your cover ticket is free too. Special weekend: Jeremy McComb, venue co-owner and Nashville musician, as well as quite a variety of up-and-coming country acts take the stage for special events. Part of history: Back in 2014, owner Dan Hoerner chose to revive the 100-year-old space to its former glory, or more specifically to the the way the Big Dipper was in the 1980s and '90s, when he played the tiered stage with multiple local bands. The venue was built well before fire codes dictated any sort of sprinkler system, which is why capacity currently sits at 110 people. Most recently the Empyrean, the Big Dipper mural outside the building, along with the inside bathrooms, have been updated. Famous origins: Hoerner is a founding member of Seattle emo act Sunny Day Real Estate. Variety shows: Along with other places in town, the Big Dipper is especially adept at bringing in shows that cater to all-ages (teens to retirees). One night a show could offer straight jazz programming, and the next soul and funk. The spot has also played host to cabaret and reggae-driven shows. Of course, rock, metal, punk and country fill the lineups, too. The buzz: In its three years as a venue, managers and owners have changed, but the beautiful barn-like space keeps on bringing classic talent to North Idaho. The mid-size venue offers one of the finest lighting and sound setups in the area. Acceptable attire: During the winter, expect to see a lot of Patagonia down jackets. During the summer? Strappy Tevas and Birkenstocks. Big moment: While musicians play here year-round, the Hive's most thrilling event is Aftival, an afterparty to many of August's Festival at Sandpoint shows. The most recent headliners included Moon Taxi, Karl Denson's Tiny Universe and American Idol winner Taylor Hicks. Only party in town: Moscow, Idaho, isn't known for its wealth of live music venues, and John's Alley is the only bar in town that consistently brings in touring and local acts. Sure, there are coffee shops that cater to a more staid crowd, and raucous house shows from time to time, but John's is open for those looking for a musical oasis. It is a 21+ venue. What you'll hear: The kind of music that makes people dance. The stage is quite high above the crowd, so it's easy to feel the rhythms in your body. Musicians of all genres do come through, but it's mostly the more jam band/reggae/rock/folk groups. Baby Bar/Neato Burrito: 827 W. First Ave., 847-1234This watering hole and burrito place regularly hosts free punk and indie music shows. The sound system may not be great, but the energy is off the charts. Eichardt's: 212 Cedar St. Sandpoint, 208-263-4005Expect a steady stream of musicians playing blues, honky-tonk or jam-band fare to a decidedly athletic clientele. THE KNITTING FACTORY: 919 W. Sprague Ave., 244- 3729Downtown's biggest rock venue, the Knitting Factory has won a loyal regional following, offering everything from local music showcases to big national acts. nYne: 232 W. Sprague Ave., 474-1621While most weekends feature live DJs playing the hits, live music shows includes singer-songwriters and plenty of hot indie acts — touring and local. Everyone is welcome here. The Observatory: 15 S. Howard St., 598-8933This new craft cocktail bar and restaurant offers one of the best sound systems in town for such an intimate space. Expect some of the coolest regional talent to grace this stage. Red Room Lounge: 521 W. Sprague Ave., 838-7613The local underground hip-hop, funk and reggae groups playing here are a tight-knit bunch; come here to let your spirit be free along with them. Zola: 22 W. Main Ave., 624-2416It's hard to go wrong with twinkly lights, tucked-away booths and seven nights of live cover bands (country, Top-40 and beyond) a week.